Kochi: The master weaver of Machavilakam has brought joy to at least 1,000 families in this village on the outskirts of Thiruvananthapuram. But personally, 64-year-old P. Gopinath, a 2007 Padma Shri awardee, weaves a tale of misery, one in which he is neck deep in debt, all because he helped the poor in his hamlet with his own money. Worse, the consortium he set up is in debt to the tune of almost Rs1 crore. Hundred cents make an acre. Another one-acre plot he owned is pledged with another bank for Rs10 lakh, also for settling consortium debts and for workers’ welfare. Notices for attachment of the property come in often and he has somehow been able to postpone the inevitable—being evicted from his own land. 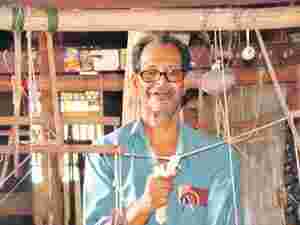 But neither recognition nor the current debt burden seem to have changed Gopinathan, a weaver who won accolades, including a Padma Shri, for his efforts to provide livelihoods to the poor, especially women in his village, through handloom weaving. He still goes around the looms, a word of caution here, some advice there, to the at least 600 weavers spread over 10 acres that he donated for this venture. His watchful eyes constantly scans the workshop for the small details, from drying the thread or weaving the zari (gold or silver thread) into the cloth or folding a woven dhoti, as he recounts the story of how he, along with others, especially the women of the village, created what is now the Eco Tex Handloom Consortium. Today, the consortium provides employment to at least 600 women in the vicinity. The son of a weaver, Gopinath started out helping his father with odd jobs at the loom when he was only 10 years old. Later, to support the family and improve his skills, he moved to Salem, Tamil Nadu, where he learnt the craft before returning. By the time he was 30, he had a small piece of land with a shed that housed his own loom. Bothered by the exploitation of women, he decided in 1972 to bring them together under a society called Mahila Samajam and trained them in the art of weaving. He also donated his land and loom to the Samajam, which was a union of at least 25 women. The groups of women grew, and by 1978, there were 26 such Samajams on a 10-acre spread working on looms that Gopinath owned. He donated this land to the women’s groups as well and continued to teach the craft and participated in the weaving himself, from which he still earns daily wages. It was not until 2006 that the government lent financial support to the Eco Tex Handloom Consortium, which had 25 Samajams under a single organization. An assistance of Rs3 crore was given to modernize the facilities, buy new looms and improve the shed structure. While the loan amount was around Rs9.6 lakh, the rest came as grant. But this amount did not include the price of land donated by Gopinath. Also, additional money had to be deployed for new looms, he said. Today, after irregular repayments, the loan amount with interest and penal interest has gone up to at least Rs1 crore, says R. Prasannakumari, treasurer of Eco Tex, who has been with one of the Samajams for 20-odd years. Each worker, who gets paid Rs125 daily, can weave a Rs300 dhoti every day, says E.S. Jalajakumari, secretary of the consortium, “But often, most of the women are unable to work the whole day. They have to undertake work at home, too, and so the daily earnings is much lower. There is a serious labour crunch," she says. The product is sold directly to traders for a small margin, which no one at Eco Tex is willing to disclose. “There is not much profit earned or else we would not have let our debts grow," says Jalajakumari. Even though payment is typically made on the spot, the main competition for this community of weavers is from mechanized looms who often pass off their product as handloom at lower prices. Concerned about the plight of the workers, Gopinath says it is necessary that the minimum wages are raised substantially so that more people are attracted to this profession. But he refuses to accept the fact that higher wages will push up cost. “Let the government offer a subsidy to promote the sales in the handloom sector," he argues. As for himself, he insists he wants nothing. “I have tried all I can to help the people in my neighbourhood. I don’t earn much. Whatever little I earn is sufficient to keep me and my wife going," he said. But his primary regret is that he may not be able to leave any wealth to his wife or children—three sons and a daughter, all of whom are educated and employed. None of them is in the weaving business. As for his future with all its debts, he declines a straight answer, instead going into how the government should support the handloom sector and what steps need to be taken for the welfare of the workers. One of his sons, G. Ganapathi, a general manager with the state-owned Centre for Development of Imaging Technology (C-DIT) in Thiruvananthapuram, says he is a proud son, adding: “The respect my father commands because of his deeds for the uplift of society makes me happy. But..."